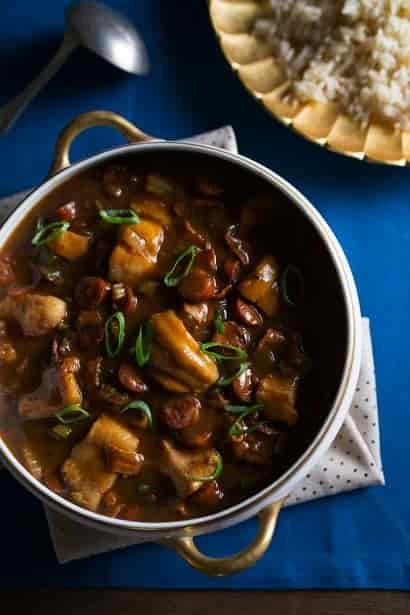 Catfish Gumbo recipe loaded with flavor, bacon and venison sausage. Make your own roux or use a mix. In a large pot, Cook bacon and sausage over medium-low heat until bacon is browned. Remove bacon and sausage from heat and reserve. Add olive oil, onion, celery, green bell pepper and garlic. Sauté until onions turn clear, about 10 minutes. Add cayenne pepper, black pepper, thyme, oregano and roux mix. Cook with roux mix for 10 minutes. Slowly add chicken broth 1 cup at a time, stirring until incorporated. Simmer for 15 minutes. Add reserved bacon, sausage and catfish. Simmer gently for about 7 minutes. Serve garnished with cooked white rice and sliced green onions.